HALIFAX -- Isaiah Bernard always avoided driving by a statue of Halifax's controversial military founder. For him, it was an obtrusive reminder of Edward Cornwallis's bloody and barbaric extermination campaign against his Mi'kmaq ancestors. Bernard wore a wide smile Wednesday as the bronze figure of Cornwallis was removed from a downtown park, one day after Halifax councillors decided it should be taken down at least temporarily. "I feel like my ancestors can finally rest," Bernard, from Nova Scotia's Potlotek First Nation, said as crews prepared to move the statue. "It's a great day to be Canadian and First Nation." 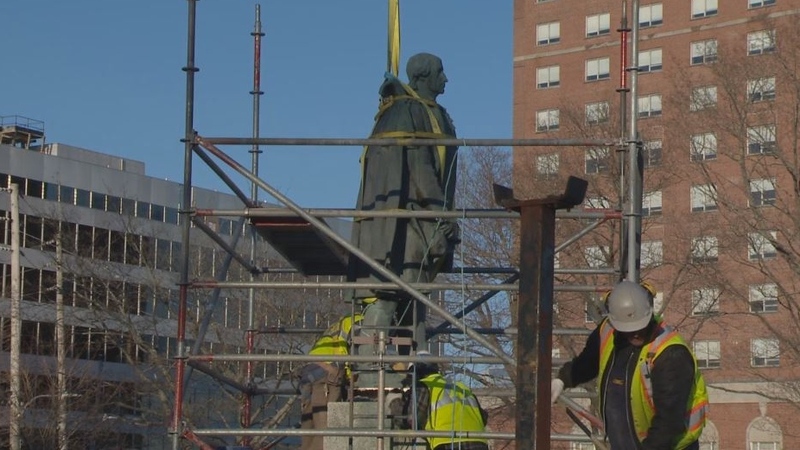 Scaffolding was set up around the monument Wednesday morning, and yellow straps were wrapped around the body of the Cornwallis statue -- which faced towards the mouth of Halifax Harbour since it was erected more than 85 years ago. An eagle flew overhead in a cloudless, late afternoon sky as the figure was lifted off its pedestal with a crane, then placed on its back on a flatbed truck. The removal was met with cheers from a few dozen people, who had gathered to watch what many felt was a historic moment. "I feel pretty good right now, pretty happy. A lot of us, we've been waiting a long time for this -- since longer than I've been alive," Mi'kmaq activist Rebecca Moore said as she watched workers make preparations for removal. "What it means to me is that it's really showing that violence against Indigenous people and Indigenous women is not OK ... and that we won't stand for it. That's what it symbolizes to me." Council voted 12-4 on Tuesday to temporarily place the bronze figure in storage until a decision can be made on its long-term fate. Cornwallis is a disputed character, seen by some as a brave leader who founded Halifax, but by others as the impetus of the 1749 scalping proclamation against Mi'kmaq inhabitants. Nova Scotia Mi'kmaq chiefs had called Friday for the statue to be taken down immediately, because a panel appointed in October to study how the city commemorates Cornwallis had not even met yet. A staff report to council highlighted rising tensions around the statue, citing a planned protest Sunday that it said could result in clashes between protesters, damage to the statue and personal injury. Leo Deveau, director of the Halifax Military Heritage Preservation Society, said he felt that "Cornwallis has become a lightning rod for a number of things, which we think is unfair. "It's not just about Cornwallis. He came with 2,500-plus people, settlers, and many of whose names exist in the city today. That's what has drawn me into this for a long time -- the stories of those settlers," he said over the sound of a saw cutting into the base of the statue. But he said going forward, a balance could be struck to reflect on Halifax's entire history. 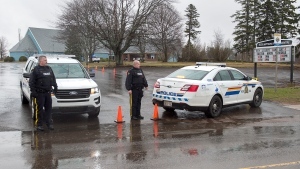 "There's been some interesting, constructive proposals around the idea of having a founding park that would represent not only the Cornwallis era, but the Acadians, the Mi'kmaq and other founding groups that came into this settlement," he said. Mariah Joe, from Nova Scotia's Membertou First Nation, said she was relieved to see the statue come down, but also felt "torn. 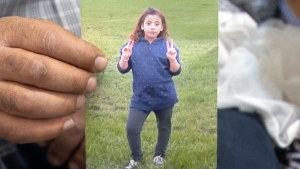 "It's historical and I think it does have a place in our society. We shouldn't just forget it. It's tricky for me," she said. The decision to topple the bronze statue of the city's founder comes as efforts to scrub colonial names and symbols from public spaces intensify. Montreal struck the name of British general Jeffery Amherst -- a soldier who reportedly wanted to exterminate native inhabitants -- from a city street last fall. A teacher's group in Ontario voted last summer to rename schools and buildings named after Sir John A. Macdonald,who was prime minister when the federal government approved the first residential schools in Canada. And a school in Saskatchewan named after a man who recommended residential schools for Indigenous youth is also considering a name change. Meanwhile, the United States is grappling with what to do with Confederate monuments, which to some symbolize white supremacy. And how is the bronze attached to the pedestal? No one knows! The records don't specify how the statue was made. That's why the workers keep stopping and starting. They're discovering what they need to use to remove the statue. But no one knows for sure since the records in 1931 don't list those figures. Scaffolding is set up around a statue of Edward Cornwallis in Halifax as workers prepare to move it on Jan. 31, 2018.